Before my flight to Abu Dhabi, my path led me to the Panorama Lounge at Zurich Airport. This is on the third floor of Pier E and is ideal for a relaxing wait before boarding; the E departure gates can all be reached within a few minutes. Although it wasn’t packed, the spacious lounge was quite busy. The main room, which also houses the bistro, was a little too loud for my liking. In other areas, however, the volume was pleasant, so I took a seat on a comfortable leather chair. The free Wi-Fi, which is available around the clock throughout the airport, had a good connection and worked without problems. For those without Wi-Fi, there are six LAN ports and five internet stations that can be used free of charge. The technologically impaired can choose from a wide selection of international newspapers and magazines. There is an ample selection of food and drink, and the coffee was good. This is not the case in many other lounges. As with many lounges, there is a broad selection of alcoholic beverages. However, for a good drink, I prefer the Swiss Lounge Bar in Terminal 1. Even though it is not on the menu, I recommend a whisky sour. From the terrace of the Panorama Lounge, you have a nice view of the airfield. I’ve been told that on clear days, you can also enjoy a magnificent view of the Alps. I thoroughly enjoyed the Panorama Lounge, and I’ll come back again when I depart from the E gates. 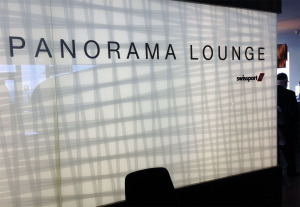 The Panorama Lounge can be used free of charge by first and business class passengers of many airlines, frequent flyers with sufficient status, and members of several other lounge programmes. All other passengers can gain access for CHF 36. Additional information can be found on the website. Oslo. A brief review via Instagram.